Are you looking to spruce up your interior a little bit? Did you know you don’t have to drop a ton of money to make tasteful changes? 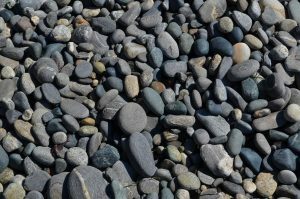 Using pebbles (or sometimes they’re called “river rocks”) can offer an immediate and low-cost change. They can instantly add a natural or rustic look to your existing home decor. All of these suggestions are inexpensive to complete; beyond the river rocks themselves, you may just need a few more items to complete each suggestion. Adventure-In-A-Box is where I found this nifty idea for your garden. You can check out their tips to ensure you get the most out of your garden markers, but this idea calls for painting up some rocks into vegetables. If you’ve ever planted a garden, it can be tough to remember what you planted where, with these cute little rocks, your problem is solved! All you need for this is a selection of river rocks and a boot mat (You want the type that is like a tray, with raised edges). Simply fill the boot mat with rocks. No need to seal it, just add an instant uplift to an old boot mat stained by salt from winter boots! You can find dozens of inspiring art pieces on Pinterest, but the main idea is that you simply gather rocks and arrange them into a picture. Secure them with glue and perhaps use a shadow box frame (or another thick frame. You can find an excellent selection at most Michaels stores.) to get them framed and then hang on your wall! The Home Daybook came up with this neat idea to store your makeup brushes. Simply find a nice glass container (I like the square holder, but you can pick your favorite), fill it with pebbles and add your brushes. The pebbles keep your brushes upright and easily accessible for you! 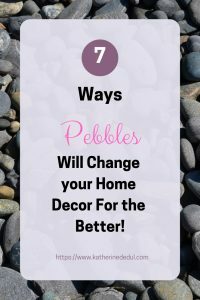 I love the style of these pebble-laden sconces and they are relatively easy and cheap to make as well. Check out the full tutorial at The Noshery! They can make a lovely accent to a bathroom or even a sitting room. The Owner-Builder Network is the mastermind behind this sweet tutorial using these pebbles to create a neat mat. I haven’t yet had a chance to try this craft myself, so I have no idea how comfortable the mat is to walk on, but it sure looks neat! You can also use these stones to create unique little landscaping refreshes to your outdoor spaces. Fresh Patio has a nice list of some neat things you can create using river rocks, everything from flowers to a lizard! 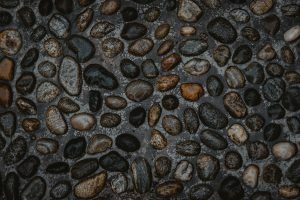 River rocks or pebbles can immediately add a beautiful and natural touch to your home decor and it is super easy to create a piece with very little effort and cost. Which idea appeals to you most? Let me know down below in the comments. If you loved this content, please share it to Pinterest or your favorite social media platform today. Previous Post: « Multi-Strand Bracelets – Everything You Need to Know to Make Them!